I bought this bottle of Korbel ...a decade ago!!! Surprisingly I never got around to opening it......even a decade later! 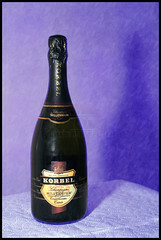 I Googled Korbel, & believe this is the only known image on the internet of an UNOPENED millennium edition Korbel bottle :) Maybe I'll get around to enjoying it..... before the next millennium LOL!! Have a safe & prosperous & Happy New Year 2010! !